For Premium account holders, Training Peaks provides an incredible amount of data on your workouts and training trends – an almost (or actually) overwhelming amount. Rest assured, I am paying attention to this so you don’t have to! But if you’re interested, some clarification on many of the acronyms and what they represent can be found below. Where? 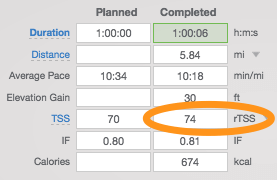 TSS is found within each workout in the summary data, alongside duration/distance/etc. Your daily TSS is also shown as red dots on the Performance Management Chart (PMC) on your Dashboard. Good news for you: it’s my job to make sure you have training thresholds and zones for each sport. And I’m always happy to share those with you – just ask! – or you can review them in your TrainingPeaks user settings. If you’re a data geek and want the know the mathematical formula, it boils down to: IF^2 X hours X 100, where IF is the calculated intensity factor for the workout. (Note that an IF of 1.00 means that the intensity factor of your workout was at threshold; an IF of 0.65-0.70 is typically considered an endurance-level bike, 0.70-0.75 is an endurance-level run). If you’d prefer to ignore the math, conceptually the TSS calculation represents how stressful the workout was on your body, and combines both duration and intensity in determining that value. Keep in mind that short, intense intervals with easy recoveries can result in the same TSS as a steady-state endurance workout of the same duration; hard intervals aren’t always harder than endurance work, what make the TSS increase is how much time you spend above your endurance zone. As a rule of thumb, a one-hour bike at 0.70IF (endurance level effort) will yield a TSS of 50. A one-hour bike at your endurance effort level will yield a TSS of 55-60. And one hour in the pool typically yields a TSS of 60 – assuming it’s a workout, which is rarely done at endurance effort level. Where? In the app, your current CTL is the blue “Fitness” number at the top of your home screen; additionally, your daily CTL is represented by the blue shaded line on the Overall Fitness chart (found by going to Feed -> Charts). On the web, the end-of-week CTL value is shown in blue at the top of the summary data for each week; additionally, your daily CTL is shown as the blue shaded line in the Performance Management Chart (PMC) on your Dashboard. Your Chronic Training Load (CTL) represents your fitness on any given day, and is calculated as a weighted rolling average of your daily TSS over that day plus 41 prior days – 6 weeks total. The more recent days’ TSS’s carry a higher weight; the TSS’s from several weeks ago carry a lower weight. Referring above to the typical TSS scores for one hour workouts, a CTL in the 50s means that your fitness level represents the equivalent of about one endurance hour of training on a daily basis, on average. For 70.3-level training, it’s typically to see your CTL peak in the 80s or 90s, and for 140.6-level training you’ll often see your CTL peak well over 100. You can also anticipate that your CTL will drop during taper. That’s okay! The slight (typically less than 10%) drop in CTL is more than offset by a greater decrease in fatigue. Where? Multiple Ramp Rate charts can be found in the app (Feed -> Charts, scroll till you see Fitness Report) and on your Home page on the web. Your Ramp Rate indicates the growth rate of your CTL. Each Ramp Rate chart shows a different time period and indicates the corresponding Ramp Rate. Most relevant is your 7-day Ramp Rate: a Ramp Rate of five to eight shows strong growth in fitness. Ramp Rates above eight for a sustained period of time can be a warning sign for overtraining. Where? In the app, your current ATL is the pink “Fatigue” number at the top of your home screen; additionally, your daily ATL is represented by the pink shaded line on the Overall Fitness chart (found by going to Feed -> Charts). On the web, the end-of-week ATL value is shown in pink at the top of the summary data for each week; additionally, your daily ATL is shown as the pink shaded line in the Performance Management Chart (PMC) on your Dashboard. Your Acute Training Load (ATL) represents your fatigue on any given day, and typically varies more dramatically than your CTL. The ATL calculation is based on a 7-day rolling average of your TSS (versus 42 days for your CTL) and is therefore more sensitive to recent training loads and variations. Where? In the app, your current TSB is the yellow “Form” number at the top of your home screen; additionally, your daily TSB is represented by the yellow shaded line on the Overall Fitness chart (found by going to Feed -> Charts). On the web, the end-of-week TSB value is shown in yellow at the top of the summary data for each week; additionally, your daily TSB is shown as the yellow shaded line in the Performance Management Chart (PMC) on your Dashboard. Your Training Stress Balance (TSB) represents your form: your “freshness,” or race readiness. It is calculated by subtracting your ATL from your CTL. It is very common – in fact, typical – for your TSB to go negative as you start training for your race, and to remain there for the vast majority of your training. How negative? A TSB that ranges from -10 to -30 is considered the optimal training zone. Dipping below that for a day or to during your biggest training weeks is not unusual. Ideally, your TSB will not go positive until just a few days before race day. On race day itself, we’d like to see a TSB anywhere between +5 and +25, depending on the athlete and the race duration and priority. Keep in mind that data does vary from athlete to athlete; the above numbers are typical but may not be directly relevant to your data trends.